This city-state has to be the poster child for stupid opulence. 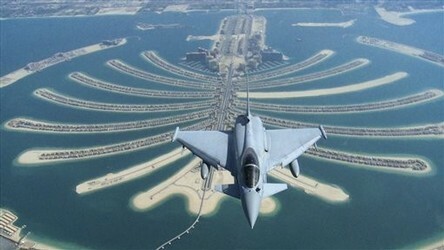 Below is a picture of a British jet on a flyby over a man made island shaped like a palm tree, Palm Jumeirah. Real estate on that island isn’t moving as expected. Believe it or not, there are three Palm Islands and another group called "The World." Then you have the Dubai Ski resort. This kind of gives you an idea where the money, we pay for gas, goes. How about the world's tallest building the Burj Dubai? Notice the foreground is a replica of Venice, Italy (to show it all would take another 15 pictures). These things are visible, want to guess at what can’t be seen? The “Cash for Hookers Program," is working quite well in the Arab world; better so than the "Cash for Clunkers" plan here in the States. These girls are bringing our oil dollars back to us (God bless them). Dubai is a house of cards. It is beyond being absurd. The UAE is stepping in to bail them out. 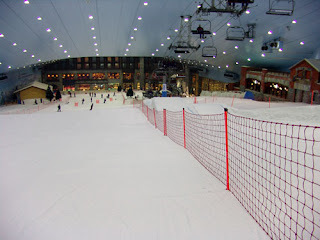 (they had a change of heart) It tends to be obvious that something is out of whack from an investment perspective when you see a ski resort in the hot desert; it is not a mirage. The estimates are around 90 billion dollars to contain the damage (multiply that by a factor of 10 for a more realistic estimate). Now if the Arabs have been storing their reserves in our banks--- and Ben has spent it all--- and they need to make a large withdrawal,- - - hmmmm. The next time you go to get gas, think "Ski Dubai." 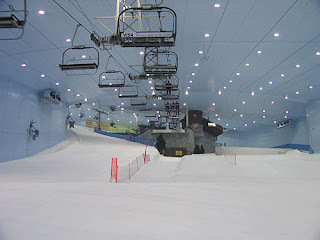 You might mispronounce the word "Ski" and that is understandable. This health care plan being pushed through Congress is pretty much nothing more than a tax hike on the young paying for the benefits of the old. 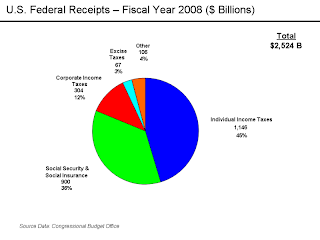 The additional funds raised and not paid out could be "borrowed" by Congress, just like our Social Security taxes were. Look at the picture below. 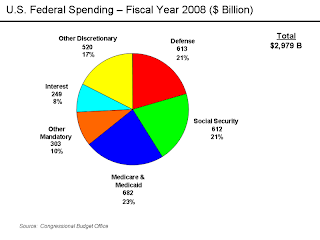 23 percent of our budget is for Medicare, 21 percent is for Social Security, 10 percent is other, and interest on the debt is 8 percent. The only things Congress can "adjust" (cut) are the 21 percent for defense or the 17 percent of discretionary spending. Good luck there. 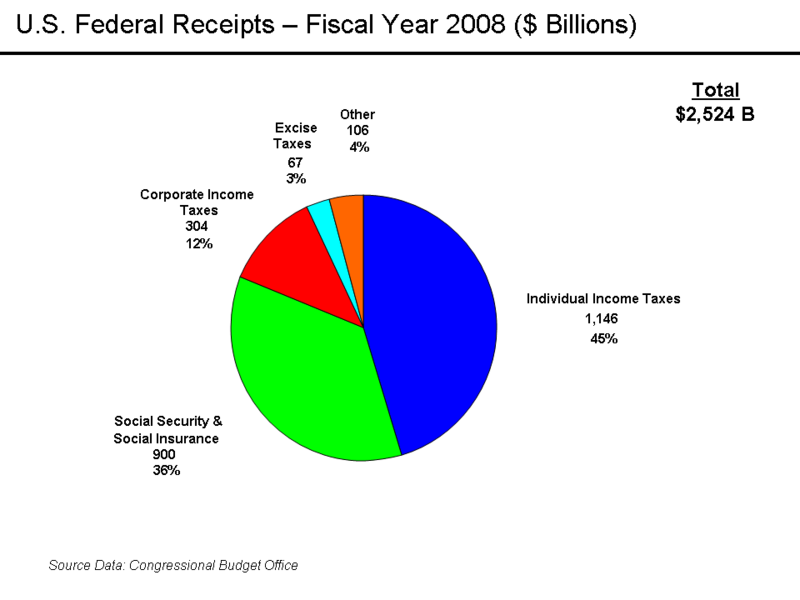 In the second chart look at the sources of income; Social Security provides 36 percent of tax revenues. Notice, the government is only paying out 21 percent in benefits to Social Security recipients; the other 15 percent is "budget money." Note: FDR claimed that Social Security would only amount to a 1 percent tax (Democrats seem to have a problem with math and that goes hand in hand with voters having a bad memory). This is where the health care tax will be the new revenue generator. Just like Social Security was during the Great Depression. But this time it will back fire on them. Congress in its infinite stupidity thinks this will solve all of our country's budget problems. They raise taxes and the taxpayer gets “free” health insurance. But there is one little item, that right now is insignificant, but will rise up to bite them. It is the assumption that most families will continue to have two wage earners. The younger generation may be able to beat this tax. When our son was born, I became Mr. Mom. My wife had a real good job and at the time, my real estate career wasn’t setting the world on fire. My wife wanted me to get a “real” job and put our son in day care. I mentally figured it out, day care would cost about $18,000 per year and gas to drive to my job would probably be $2,000 per year. Plus we would both have to do the cooking, cleaning and shopping; figure that has to be worth about $5,000 per year. Add it up and it totals up to $25,000 (after tax income) so in reality, you need to earn $30,000 (before taxes)to justify getting a job. On an hourly basis, that figures out to about $14.42 per hour (figure $15.50 if health insurance passes). Being a house wife, may be a big positive for family financing especially if the prospective employer is only offering $9.00 per hour. Government health insurance would be one less worry for the wife and kids. The husband could come home for “lunch.” Their actual standard of living would be better than the family with two wage earners. The net effect of this health insurance could inadvertently reduce the number of working women (with young children), which would be a reduction of taxpayers paying into the system. Any way you look at it, there will be more people “not working,” or working under the table. Social Security collections as well as the new Health care tax could probably decrease well below anticipated government expectations. Tax increases did not work during the Great Depression, including the Social Security tax. I read history, I don't interpret it. Congress needs to share a cell with Bernie Madoff. They both played the same game, the only difference, Bernie knew his investors. Geithener Sends US Gold to China??? The IMF just sold 403 metric tons of gold, this amounts to 12,965,649 fine troy ounces. 200 tons of it went to "India." In order to sell gold, the IMF has to have an 85 percent approval of all of the members and from what I can surmise the US has about 17% of the voting rights, the toys were ours so no one objected to this transaction. To the IMF and the countries of the world, gold has no real value. Each country can purchase gold from citizens with their own currency. It used to be that a currency was backed by gold and could be redeemed at the gold window. President Nixon closed the gold window for the US. So in essence, gold has little meaning as far as trade goes. With the financial markets, options can be bought to cover currency fluctuations. Gold has been removed from the equation. One factor not often considered is that there are security considerations for storing gold. You have to keep it in a secure and controlled environment. In third world countries that is just about impossible. Several countries have “gold rooms.” This is where gold is stored in different locations around the world. So if the US was to transfer gold to Brazil in the New York office, it would go from room 10A to 12b. If the room 12b got filled up, Brazil would send a boat to pick up the surplus. This is how it worked when the world was on a gold standard; that all ended 35 years ago. Figure that the IMF doesn’t deal in gold, it deals in currency. It loans money not gold. Gold is not a commodity that is useful in lending, it is not bad as collateral, but to a bank, it has to be sold for currency before they can use it. The IMF doesn’t need gold, it needs currency. Gold has no value to them. It is like a person in the desert with 1000 ounces of gold and no water, you can’t drink the gold. I contend that the IMF never had any gold and doesn’t need any; it has no functional purpose to them. They have the rights to currency valued with gold for each country, based on their current conversion rate and that is all they need to operate as a bank lender. Our representatives at the IMF are Tim Geithener and Ben Bernanke. So what are we looking at here? Figure that India was just the middleman. Let me suggest that China wanted some assurances that the money loaned to us was not just paper. I am suggesting that the US transferred to the Chinese 403 metric tons of gold as a down payment on our 1.5 trillion dollar tab with them. That figures out to be about a 10% 1% cash payment on debts owed. Can you imagine the headline “US gives China 12 billion in Gold.” Let’s face who else has 403 tons of gold and a need to back the paper they have already printed? I could be dead wrong on this, but something smells funny here. Unemployment benefits have been extended to 99 weeks, (93 if you are in Kalifornia). If I was 40 years younger, I'd buy a surf board and a gallon of suntan oil. You know times are tough when you hear on the radio that the Mexicans are sending money to the US for illegal aliens out of work. The good news is that the country can still afford to pay the interest on the national debt. 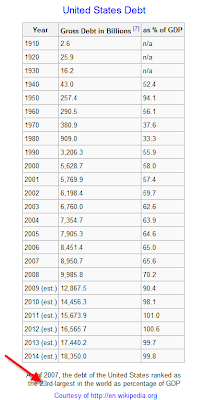 Notice that it is also figured as a percent of Gross Domestic Production [GDP = private consumption +gross investment + government spending + (exports-imports)]. So as a percent of GDP, you have the ratio Debt to GDP. It kind of obfuscates the dollars and cents/sense. 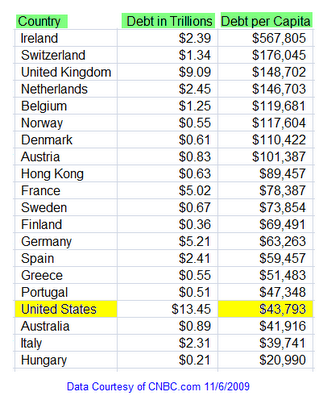 The red check mark at the bottom of the chart points to the sentence; “The United States ranked as the 23rd-largest in the world as a percentage of GDP. It gives the reader the warm and fuzzy idea that 22 other countries are messing up worse than the US. Here we are with visual aid number two. 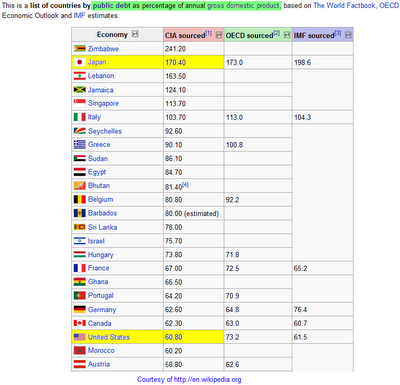 This shows standings according to public debt as a percentage of annual GDP. Japan is almost at the top, beaten out by the small country of Zimbabwe. Take your pick of whose figures work best for you. No surprise here, the US is way down the list, just like the claim from the chart above. Look at the next chart below. 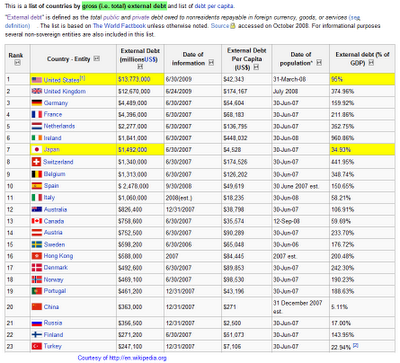 Here the countries are listed by the dollar amount of external debt. The US is at the top. This is where you ask the waiter for your check and choke. What happened to Zimbabwe? Note that Japan is a special case. They have 7 trillion in debt but most of it is internal. The last chart is more or less a financial report card for the major world players. Ireland looks like is has run out luck. As long as interest rates remain low, these governments can keep the punch bowl full. Take away Australia, Hong Kong and the US, and the rest are members of the European Union that is tied to the Euro. Some of these countries have real good health care plans. It looks like it just gets put on a "bar tab" AKA National Debt. Right now the US government doesn’t even have two pennies to rub together and they are busy printing money to stimulate the economy. By god, everyone will have a home, a car and health care ("A chicken in every pot and a car in every garage" sounds kind of familiar--Hoover comes to mind). Worry about getting a job after the handouts stop! Congress is in too much of a hurry to spend the country out of this “Recession.” It’s a little like dropping a frozen turkey into a hot deep fat fryer. You mise well attach a radio beacon to it, so you can track it, after lift-off. If we summarize the present banking problems (including Fannie and Freddie), it is pretty obvious that the Federal Reserve and Treasury have bought all of the bad housing. No depositor has lost a dime. The last 16 bank closings have had absurd balance sheets. Oddly enough U. S. Bank Corp took over the last nine closings. In my opinion, this isn’t really the time to expand your market share in the banking industry. The absorbed banks just might make U.S. Bank Corp too big to fail and I imagine any losses from the assumed loans are insured by the FDIC or put on the books at a marked to market value (some sort of "can't lose" deal). If you simplify all of this, the FDIC is cashing out the failed housing loans written by the closed banks. Then they avoid further losses by folding the rest of the failed bank’s loans into the buyer bank. In the normal market of the 60’s and 70’s, a home mortgage included a 20% down payment. So if there was a problem with the market, the bank was not out of pocket until the home values decreased 20%. With the 100% loan, the bank is the real owner of the property the minute the note is signed. With the drop in property values of 40%, the banks are left holding the bag. The words “Road Kill” come to mind. 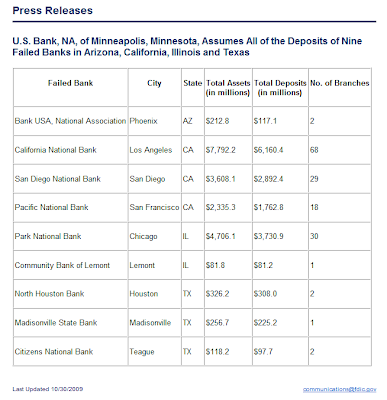 The picture below displays the info on the last failed nine banks, assets to deposits should match in value. Some of the values are so out of whack, it questions whether or not you really need a book keeper to tell you that your broke! Now we have a new FDIC ruling that commercial loans can be carried on the books at original price for bookkeeping purposes. They don’t have to be marked to market. I would call this “Creative Financing.” Common sense suggests that this is wrong, and I am just pointing it out. If you thought housing loans were bad, commercial loans are toxic. If a 10 million dollar shopping mall goes into bankruptcy and is sold for 5 million, the buyer might only have to come up with a 5% down payment (250K--- insurance companies do this all the time). So to the person with an expiring lease can probably get a real rent reduction by switching malls. What happens next? Retailers vote with their feet. The irritating thing here is that more commercial property falls into bankruptcy. It’s not a fast process; it will take about 5 years (In our area, this was evident 2 years ago). So I guess we have a head start. I just don’t know if winning a bankruptcy race is the sort of race we really need to win. So far there have been 116 banks that have failed this year, 10 times more could fail over the coming year. Transferring the assets from small banks to larger banks, doesn’t make the problem loans any more secure, it just passes the problems into the future. It is very comforting to know that the FDIC has everything under control--We get to watch them paint themselves into a corner.